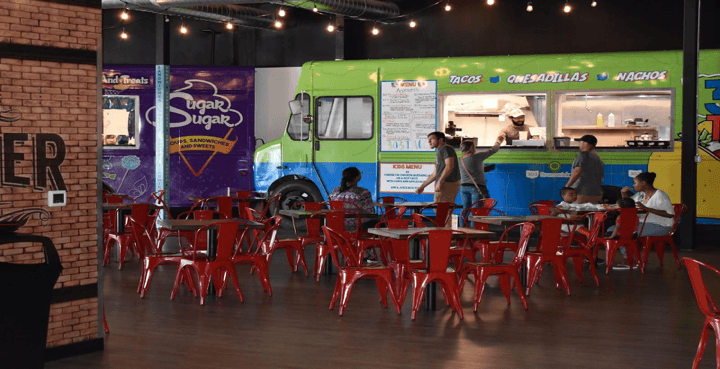 Scene75 Cleveland holds the countries first ever indoor food truck court. When asking the CEO of Scene75 why he chose Food Truck Alley as a concept for Cleveland, he said, “In creating the first Food Truck Alley, our intent was to create a fun, lively venue that served a variety of exceptional food through quick, friendly service. Food trucks can be fun. Scene75 is incredibly fun. So why not merge the two to double the fun? As we continue to grow, we as a brand will continue to reflect upon, tweak and improve our food and beverage offerings to ensure we always provide our guests with the quality and service they expect from Scene75.” Don’t be fooled by the look of the trucks – these aren’t rolling away anytime soon. Though each truck was physically built from an actual truck that was cut in half, these trucks are permanent fixtures within Scene75 Cleveland. Scene75 Cleveland’s four food trucks all have different varieties of cuisines you can choose from. The trucks offer tastes like Italian, Mexican and American. It also features a sweets truck with all your favorite desserts and snacks. What does this mean for you? It means everyone in your group or family will find food they love! No need to choose only one type of cuisine; order from each truck to get a true taste of the world’s cuisines. With so many great options, eating at Scene75 Entertainment in Cleveland is easy and appeases all. Scene75’s food truck workers are very kind and understanding, but perhaps even more important than the service they provide, they produce food made to order. The food is freshly prepared to your order; this is great for those who are a bit more particular about their food selections or who may have food allergies. The food trucks aim to please and boy do they deliver! Whether you are in the mood for pizza, burgers, or tacos, Scene75’s Food Truck Alley is ready to please. When you are with your family or a group, the last thing you want to do is sit at a table and wait for hours for your food to come out of a kitchen. At Food Truck Alley, the trucks are dedicated to preparing food not only freshly but also quickly. This is great as it allows your group to get back to the real action – the 150 games and 10+ attractions – in a hurry. The products used in Food Truck Alley feature real ingredients that don’t sacrifice quality in the name of speed. Come hungry! Let’s face it, we are all on a budget of some sort. And that’s the best part of Food Truck Alley. All of Scene75’s food trucks were designed with a menu that allows for affordable pricing, ensuring all guests can enjoy the unique, quality food offered. Additionally, each truck offers unique meal deals and specials that allow patrons to try new items at an affordable cost. You may not find steaks on the menu at Food Truck Alley, but when your group is eager to return to the action of the game floor, a great sandwich or pizza is all they really desire. And on that note, Scene75 delivers with excellence!